Spencer: What are the X-Men best known for? I’d honestly say that there’s two answers to this, because while thematically the X-Men are most often used to explore discrimination and social justice, in execution they’re just as well known for their unwieldy cast, soap opera dramatics, and byzantine continuity. I think what I like most about Tom Taylor and Mahmud Asrar’s debut issue of X-Men Red is how heavily it leans into that first aspect, while ignoring the latter almost entirely. There’s plenty of character within these pages, of course, but this is first-and-foremost a title with a mission and a message. That message is evident from the very first scene, where Jean Grey and her team of X-Men rescue a young mutant from a bloodthirsty mob. 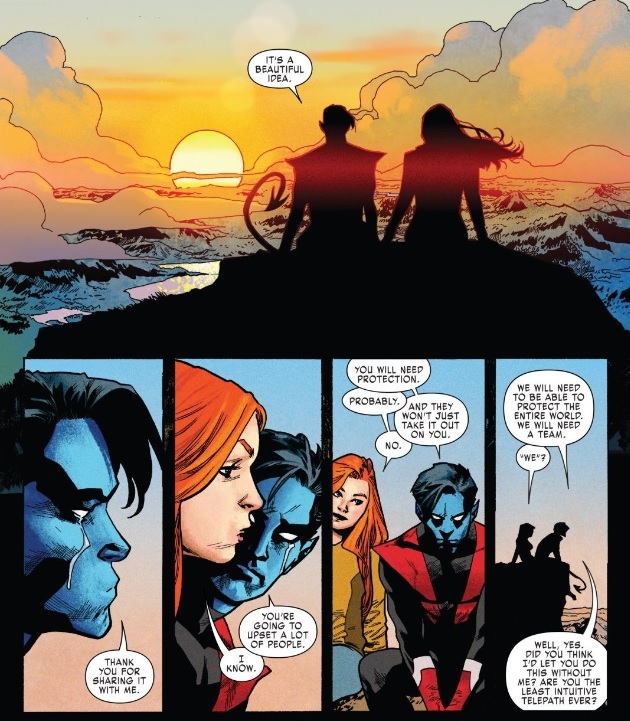 It’s a familiar scene for an X-Men book, yet Taylor still makes it absolutely heartbreaking. Being threatened, dehumanized, and betrayed by a parent, by someone who should love you more than anyone else in the world, should be an unthinkable scenario, yet it’s one many in the LGBT community are unfortunately familiar with — and facing physical danger due to their race or sexuality is a situation millions have dealt with. Thus, while there is a supervillain in this book (more on her later), the real “villain” of X-Men Red is all too familiar: hatred and discrimination. That’s the threat Jean and her team face, and it means that they (and the series) prioritize saving and protecting people over fighting criminals. This is a series about helping and healing — the title of this issue is even “Heal the World,” and while we don’t know anything yet about the new X-Men Taylor introduces, even their names (“Gentle” and “Trinary,” which brings to my mind “Triage,” a term closely related to healing) recall more pacifistic ideals. This first scene serves as an in media res opening, which I normally take a strong moral stand against, but I think this one actually works quite well. It’s not trying to set up some twist or skip straight to the action — Taylor and Asrar instead use it to essentially open the series with a seven-page mission statement, again emphasizing theme above all else. They then turn back the clock two months to a carjacking gone wrong. While Wolverine and Honey Badger take down the thieves, Jean’s big hero moment is rescuing and comforting a mutant baby, establishing that the traits she displayed in the opening scene are an intrinsic part of her personality. How, then, does she build those traits into an entire X-Men team? 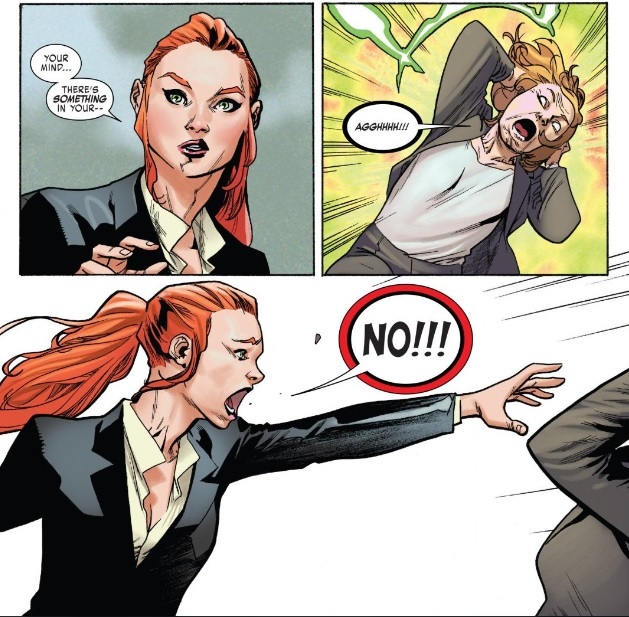 Jean Grey is a complicated character, and her recent resurrection hasn’t simplified that. Taylor smartly avoids her baggage throughout this issue — he doesn’t dig into the Phoenix or her dead husband or her time-displaced children or her time-displaced doppleganger — but he doesn’t completely ignore her past either. Returning from the dead has given Jean a new, more urgent perspective on the world, and has caused her to reach out and look for ways to actively change it. The above scene establishes just what exactly she’s up against: a world that should feel familiar to us all, one that’s angry and divided, one that fuels the very hatred Jean fights against in that opening sequence. That’s not something that can be fought with fists or powers — it will take diplomacy. Jean’s team is designed with diplomacy in mind (Kurt is chosen for his heart, and Namor for his royal title), and her ultimate plan to give the mutant race a voice in the United Nations is one that harkens to familiar X-Men themes and storylines (Genosha, Utopia, even Xavier’s initial dream for the X-Men), but evolves and advances them. Jean even initially formulates her plan by scanning the minds of the world’s greatest geniuses. Again, that makes this a title where power comes from empathy, knowledge, and diplomacy, and the art emphasizes this just as well as the story does. Asrar draws striking figures and thrilling action, and even gives Jean a big action splash page early in the issue, but Asrar’s layouts give the same kind of attention to less conventional heroic moments as well. For example, the fourth panel here practically paints Jean as a straight-up action hero. The panel goes full-bleed as Jean walks towards the camera, framed directly in its center — only, instead of walking away from an explosion or a downed enemy, her heroic feat is calming a petrified child. 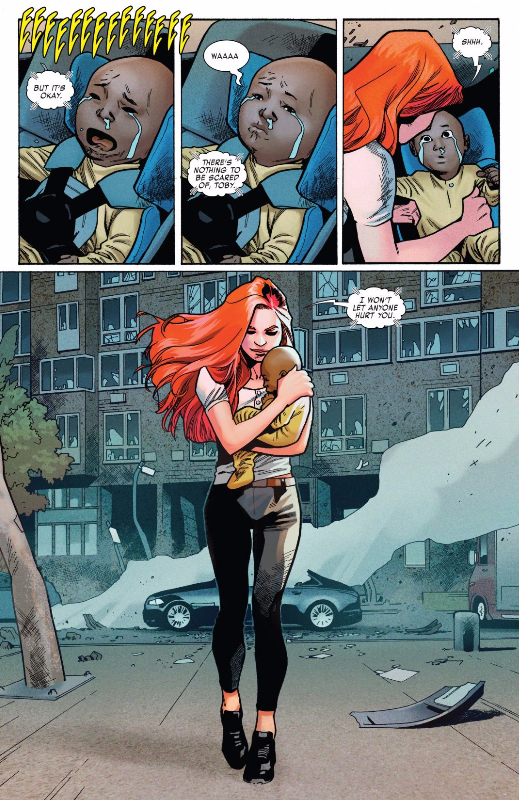 Those are the kind of acts that matter the most, that make the greatest difference in X-Men Red. That almost makes it disappointing when an actual supervillain shows her face. I find Cassandra Nova to be an interesting character, I think her history with Jean and her unparalleled hatred of mutants will make an appropriate foil to this new team, and it’s probably a good idea to give the X-Men somebody to punch, but still, I kinda wish that “society” had remained Jean’s greatest enemy. It’s certainly a powerful enough villain, and it’s what provided this issue the unique take and smart commentary that so charmed me. That’s only a minor quibble, though, and one I suspect won’t last long as Nova becomes more involved in the story. I otherwise loved this issue, and I think it has a kind of simplicity and sense of purpose that’s been missing from much of the X-Men line over the past few years. How about you, Ryan? What’s your take on this one? Ryan D: Well said, Spencer. I think you really hit the nail on the head while talking about the ethos of this series thus far, and that’s what is so refreshing to me, as well. You could think of the team assembled for X-Men Red almost as the spiritual antithesis to an X-Team such as Uncanny X-Force by Remender and Opeña. Their gimmick was to be the black ops team doing the things to save the world which were too dark and dirty for the regular X-Men, while Red’s mission statement is to achieve what decades of superheroism couldn’t. It’s an idea so simple that I can’t believe it hasn’t come up while sitting around, chatting with fellow nerds. In this universe of Omega-level mutants and demigods, why not use the some of the strongest psychic powers to problem-solve using the greatest minds of a generation. If Google or Apple can hire think-tanks to find the next tech breakthrough which will sell us more phones, then why not this? This is one of the most exciting and engaging non-action scenes I’ve seen in a while. Asrar stages it perfectly by first letting the two characters drop out to silhouette and letting the grandiosity of a sunset mirror the scale and scope of her idea, the image bleeding to the edge of the page and providing the setting for the next steps. Then he brings us to the smaller beats of character and change with the thin, vertical panels: an isolated Kurt visibly crying from the beauty of the plan, him looking sideways, making up his mind at a profiled, stalwart Jean, then finally to shots of the two framed together, now bound in the venture, a teammate back from the dead conspiring for good with a dear, dear friend. I’m so glad that Taylor and Asrar took their time with this storytelling, because it is lovely and actually succeeds in driving the stakes up in the issue by giving the audience a physical example of how essential this mission is. This is where Cassandra Nova comes in. Despite the constants of hate and discrimination, the deck seems stacked in the favor of the protagonists. After all, Team Red — with their powers and great minds and some political backing — should be the equivalent of a Batman or Reed Richards in a fantasy “who would win in a superhero fight?” scenario. Nobody can beat them because they are prepared for any and all eventualities. Cassandra Nova is the eventuality which they couldn’t foresee, throwing the best laid plans out the window, bringing the team to a point of crisis (the next issue is titled “Exiled!”, after all) necessary for a full dramatic arc. I love that last panel. There’s a real sense of urgency and motion to Jean. Both the character and her declaration, lettered carefully by Cory Petit to read differently than the “AGGHHH” in the preceding panel and the brutal, vowel-less, visceral “CRNCH” onomatopoeia in the next, take up the bulk of the panel. The lines of motion by the just-out-of-frame victim carry us to the gory surprise on the next page. And that wonderful hair of space between Jean’s outstretched hair and the ambassador is a timeless visual convention for spatial tension that can be seen in such paintings as The Creation of Adam or Watson and the Shark. This is great storytelling which shows that, for all of Jean’s gifts and best wishes, she has been out-played. That’s the design of a good villain. As John Truby wrote in The Anatomy of Story, “Create an antagonist…who is exceptionally good at attacking your hero’s greatest weakness” (paraphrasing from the incomparable Lessons from the Screenplay). Jean’s greatest strength and weakness is her deep empathy and compassion, of which Nova has none. 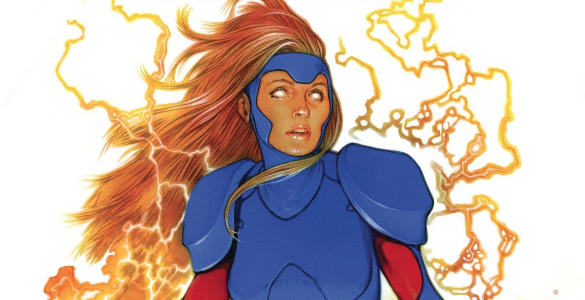 Though Xavier may be dead and buried, Cassandra Nova is proving to be Jean’s equal and opposite in an exciting way. I would argue, then, that “society,” in the context of this story which features a polemically opposed villain, rather fills the same role that the zombies do in a title like The Walking Dead. Though we get a page of a TV pundit spitting hate against the mutants and lamenting the “politically correct” à la Alex Jones or Fox News, the acknowledgement of Outrage Culture proves to be a backdrop for the main plot here, as “society” — to keep using your term, Spencer — functions more on the “chaotic neutral” side of the classic D&D alignment scale. It’s the very real and present force in the background through and around which Jean must act in the upcoming issues. I applaud the handling of the politics thus far. The UN chapter provided a concrete, real-world rooted example of the appropriate channels needed for change to take place in our modern world. Jean seems empowered and self-possessed when addressing the council, and it’s always a welcome change of pace when semantics can trump a “fastball special.” Also, as someone who just spent two years in London, I found the representative from Great Britain, a clear Theresa May analogue, to be an interesting inclusion. May, a self-identifying One Nation Conservative, came on board to “steer the ship” in the post-Brexit UK, proudly stands her ground in the real world as anti-immigration and isolationist. In this comic, the rep plays the part by challenging Jean over the ability of a race to claim status as a nation, but then, “off-camera,” bemoans Britain’s withdrawal into itself. But this is all in the context of her being possessed by Nova, so it’s tricky to really pull her real agenda from Nova’s from, perhaps, the author’s. This is, as Spencer said so eloquently, an issue with a mission and a message; however, I can’t help but think about what happens next. Jean’s political ambitions seem ruined by Nova thus far, but even if the reborn Grey topples the villain, how far can the creative team, in the context of a complicated universe featuring a discriminated-against race, take any sort of progress managed? If Jean Grey, backed by her supreme mind and the best and smartest intentions of our age, can not begin to solve the long-standing issues of our generation inherited from the past, what would be the parable or lesson to learn from this series? This is a heavy and deep proposal from the creative team, and one of the most important uses of X-Men’s inherent ability to fit into social issues that I’ve seen in some time. I’m not entirely sure why I picked this up. Maybe it was because Gentle was from one of my all time favourite runs (yeah, Gentle is not a new character at all. He’s a decade old), or because I really wanted to know how the hell you successfully put Gentle in a team (the whole idea of Gentle is that using his powers cause him to have seizures, as one of those examples of mutants with unromantic powers). But I’m really glad I did. It looked bad at the start, with a cliche cold open that read like every other X-Men book and gave no suggestion of anything special. But it quickly evolved into something special. In fact, the big thing missing about your discussions about Cassandra Nova is how fitting she is in a story that feels like an evolution of Morrison’s X-Men. Who else could you use, in a story that positions X-Men as a social group engaged in the world as a society. One where the idea of mutants as a culture, as opposed to mutants as a bunch of special people being hunted by villains. And by going this route, Taylor gives the X-Men something they’ve been missing for a long time – a sense of true direction. AN X-Men book that isn’t just merely there, but with a real sense of existing as something with a story to tell. 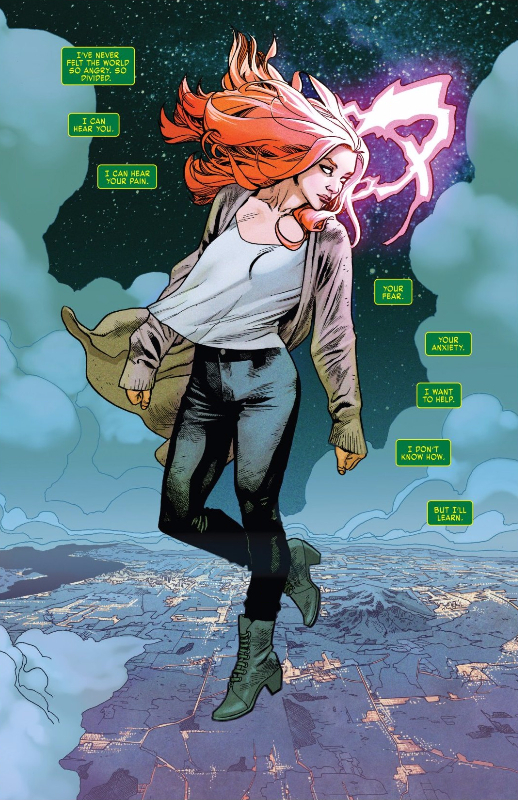 As a ‘Jean Grey is back’ sort of story, it doesn’t exactly make the case for Jean Grey being back. But it uses the publicity of Jean Grey’s return to launch a book that many characters could have led, but let’s a great premise arrive. Seeing the politics at play here, and the sense of an actual mission, an actual attempt to build something, quickly makes this a comic unlike anything else. And Cassandra Nova is a great villain, because as much as society is the true villain here, you need to have some figure to represent that darker half. An antagonist, as opposed to amorphous hordes. And she works well, as she isn’t physical. In fact, what she truly is, is our Dark Side. This book really excited me. It just tells a story unlike anything else. Seeing a band of heroes band together to construct something grand and world changing, to address the problems they face in real ways instead of the wheel spinning superhero comics usually do (I love ya, comics, but the tropes of superheroes is always about dealing with symptoms, because if they fixed problems, the story would disappear), creates a book that really worked for me. And a political thriller is the sort of genre I love the sound of. Can’t wait to see how it builds from there. See how the group comes together, and what Jean’ plan ends up being. This issue feels like a well of infinite potential in a way no other book does. Matt, thanks for the heads-up on Gentle. I really should have researched both characters before assuming they were new. I can never take for granted the fact that just because I’ve never heard of an X-Man it means they’re a new character, the way I can for most other properties. There’s just too many of em! Also agreed on most of the X-Men Red team costumes being ugly. It’s the big X’s on their stomach like targets that really turns me off. I hope they don’t spend a lot of time in those costumes — though it is nice seeing Laura in yellow again. I think the reason Gentle has been used is that he is probably the only Wakandan X-Man, and therefore is there for the same reason Namor is. Very interesting choice, as Gentle is obscure even by obscure X-Men standards. THe whole point of him was that he was the quintessential background X-Man, a character who could rarely come to the foreground because of his disability and what this meant for him and everyone around him. Very odd seeing him hulked up, especially in a casual scene, and I think I may have to do a post about assistive technology, disability and speculative fiction soon. But yeah, there are so, so many obscure X-Men, the natural consequence of a franchise that needs a new intake of students every decade for thematic reasons. Always great when one of the forgotten ones turn up again, even if it is never Surge. The entire team’s costumes don’t look good, but Jean’s is a special level of bad. The big X’s are certainly a problem. Not entirely sure what I think of Laura back in yellow, as I don’t think sh elooks good in it. The grey was certainly an aesthetic improvement, even if Taylor quickly decided that he didn’t want to address the thematics of Laura wearing an X-Force uniform. Yellow was great thematically, but just never looked good. I think it had something to do with her skinny body.